Great Scott! Is that a DeLorean time machine in Keynsham? A rare sports car that looks just like the iconic time-travelling vehicle from the Back To The Future films is turning heads in Keynsham. For most of us, filling up at the petrol station or taking a quick drive to the shops is generally not that eventful. But when you drive a rare sports car, of which only a few thousand were ever made, it tends to turn heads. And when that car looks just like the time-travelling vehicle from a highly successful Hollywood film trilogy of the Eighties, then it tends to stop traffic. The Back To The Future films, starring Michael J Fox as Marty McFly, also made an unlikely icon of the DeLorean sports car, which had proved something of a flop when introduced to the American market a few years before in 1981. 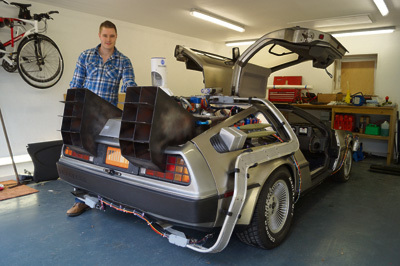 Its stainless steel body and gull-wing doors, not to mention the lights and gadgets fitted to it by the mad scientist Doc Brown, captured the imagination of many a viewer – not least Ollie Wilkey, from Keynsham, who fell in love with the car when he first watched the films as a 10-year-old. Fast-forward 15 years, and Ollie is now the proud owner of not one but two DeLoreans, one of which has been modified to look and sound just like Doc’s time machine - by a former NASA engineer no less. Ollie said: “It seems like a dream to own it – there are only around 120 DeLoreans in the UK and only four that have been made to look like the car from Back To The Future. It is the ultimate boy’s toy. “It does everything you would imagine it could do – you can punch in the dates on the dashboard, it has hover wheels and lights so it looks like it’s floating, there’s a ‘flux capacitor’ and external speakers to play the film’s theme tune by Huey Lewis and the News. With its extra-wide, low-to-the-ground body, hard-to-source spare parts and intricate modifications, Ollie admits it’s not a car you should take out every day. And on the rare occasions when the British climate is dry enough for this fairweather vehicle the attention it attracts – even without the lights flashing and speakers blaring The Power of Love – makes getting from A to B rather difficult. “Even a couple of police officers stopped their car to have pictures taken with it once,” says Ollie. Ollie, who works in property with OJW Inventories, bought the modified DeLorean from another member of the UK DeLorean Owners Club, who hired it out for special occasions, a venture Ollie is hoping to build on here in the West Country as well as taking it to some car shows and community events. To find out more, visit www.fusiontimetravel.co.uk, email doc@fusiontimetravel.co.uk or call Ollie on 07828 790 512.